Every studio, be it a professional recording studio or just a home studio, needs a good set of monitor speakers, with a flat frequency response so you can hear exactly what the recording will sound like. 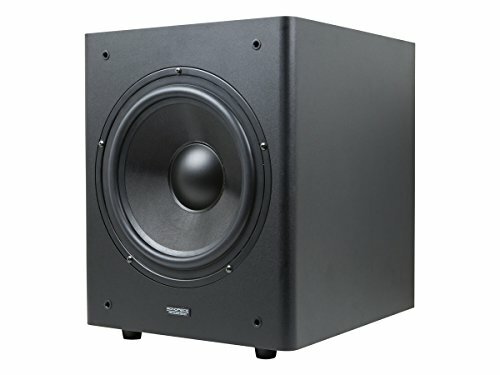 If your mix needs a little more energy in the bass, then you should get a 10-inch Powered Studio Subwoofer from Monoprice! This studio-quality subwoofer designed to be integrated with your studio monitors, for use with recording, mixing, and mastering duties. It features a built-in 200-watt (RMS) class AB amplifier. Designed for professional use, it features two balanced XLR and two ¼” balanced TRS/ unbalanced TS audio inputs and outputs. It boasts a 30 ~ 150 Hz frequency response with a signal-to-noise ratio greater than 90dB (A-weighted) and less than 0.03% total harmonic distortion at its rated power. It uses a 10" fiberglass composite cone and produces 110dB peak sound pressure level at 1m. It features a 1/4" TS input for use with a foot switch (not included). The foot switch allows you to bypass the subwoofer and its crossover, allowing the original, full-range signal to be sent to the outputs. This allows you to compare your mixes with and without the subwoofer handling the lower frequencies. 200 Watt RMS power give you plenty of headroom to hear extremely clean bass reproduction of your mix and is capable of shaking just about any studio environment when the mix is good. Take control of the sound with -20 to +6 dB gain knob, 0 or 180° polarity switch, and auto on function so your bass mix is exactly where you need it every time for any type of music project.